Viśuddha also known as Vishuddhi, is the fifth primary chakra according to Hindu tradition. Vishuddha is positioned at the neck region near the spine, with its ksehtram or superficial activation point in the pit of the throat. This chakra is white with 16 purple or smoke coloured petals, and within the pericarp is a sky-blue downward pointing triangle, within which is a circular region which is white like the full-moon, representing the element of akasha or aether. This region is represented by the deity Ambara, who is white in colour, with four arms, holding a noose and a goad, making the gestures of granting boons and dispelling fear, and seated upon a white elephant. 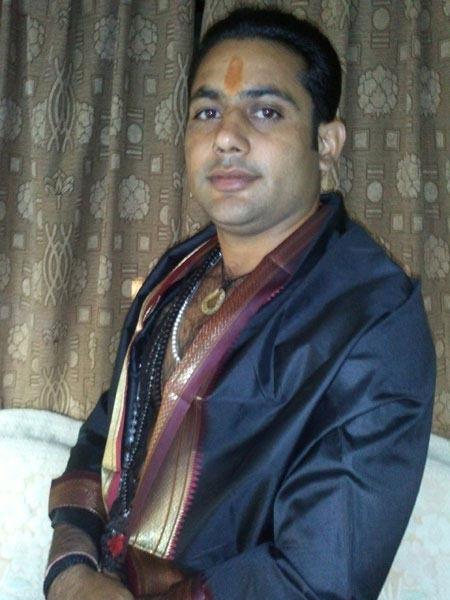 The bija mantra (seed sound) is the syllable हं haṃ, and is written in white upon the chakra. In the bindu or point above the mantra resides the deity Sadashiva, who has 5 faces and 10 arms. The right side of his body is a white Shiva, and the left half of the body is a golden Shakti. He is holding a trident, chisel, sword, vajra, fire, a great snake, a bell, a goad, and a noose, and is making the gesture of dispelling fear. He is clad in a tiger skin. His Shakti is Shakini, who is shining white, with five faces, three eyes each, and four armed, with a bow and arrow, noose, and goad, and seated on a red lotus. NB: Some vowels listed above do not strictly correspond to the grammatical definition of a Sanskrit vowel, specifically ॡ ḹ, अः ḥ, and अं ṃ. See Sanskrit Phonology for details. The petals correspond to the vrittis of the mantra Ong [Aum], the Sama-mantras, the mantra Hung, the mantra Phat, the mantra Washat, the mantra Swadha, the mantra Swaha, the mantra Namak, the nectar Amrita, and then the seven musical tones. Vishuddha chakra is known as the purification centre. Here the nectar amrita that drips down from the Bindu chakra, and is split into a pure form and a poison. In its more abstract form, it is associated with higher discrimination, and it is associated with creativity and self-expression. When Vishuddha is closed, we undergo decay and death. When it is open, negative experiences are transformed into wisdom and learning. The success and failure in one's life depends upon the state of this chakra (polluted/clean). Guilty feeling is the most prominent reason for this chakra to block the Kundalini Energy moving upwards. It is associated with the element Akasha or Æther, &nd the sense of hearing, as well as the action of speaking. Meditation upon this chakra is said to bring about the following siddhis or occult powers; vision of the three periods, past, present and future; freedom from disease and old age; destruction of dangers; and the ability to move the three worlds. Closely related to Vishuddha is a minor chakra, located in the roof of the mouth, called Lalana. It has 12 red or white petals, that correspond to the virtues of respect, contentment, offense, self-control, pride, affection, sorrow, depression, purity, dissatisfaction, honor and anxiety. Inside is a red circular moon region. This acts as a reservoir for the nectar amrit. When vishuddha is inactive, this nectar is allowed to run downwards into Manipura, where it is consumed, resulting in physical degeneration. Through practices such as khechari mudra, however, the nectar can be made to enter Vishuddha, where it is purified, and becomes a nectar of immortality.. This chakra is located in the neck and throat. Due to its association with hearing, it is related to the ears, and due to its association with speaking, it is associated with the mouth. Vishuddha is often associated with the thyroid gland in the human endocrine system. This gland is in the neck, and produces hormones essential for growth and maturation. In Kundalini yoga, Vishuddha can be opened and balanced through practices including asanas (such as shoulder-stand), pranayama, Jalandhara Bandha (throat lock), and Khecarī mudrā. 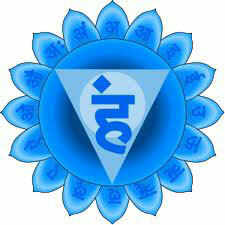 This chakra can be cleaned/opened by meditation and also by practicing singing or playing instrumental music. The throat wheel is an important centre in the Highest Yoga traditions of Vajrayana. It is circular, red, with 16 upward pointing petals or channels. It is of particular importance for the practice of Dream Yoga. Correctly meditating upon it before going to sleep should produce lucid dreams, within which one can continue to practice yoga. Western occultists make various differing kabbalistic associations with Vishuddha. Some associate it with the hidden sephirah Da'at, where 'wisdom' and 'understanding' are balanced in the supernal realm by the aspect of 'knowledge', a tangible idea, which is then expressed, leading to the act of the creation, others associate it with the sephirah Chesed and Geburah, mercy and strength, which are sephirah intimately associated with morality, and the concept that both expansion, as expressed by Chesed, and limitation, as expressed by Geburah, are necessary for the creation of individual beings. In terms of ethics, this is expressed by the yamas and niyamas ( do's and do nots ) of yoga. In the system of the Sufi Lataif-e-sitta there are no Lataif in the throat, but there are three in the region of the heart which are arranged horizontally and not vertically. They are the Qalb, or heart, which is the battleground between the lower forces of the Nafs and the higher forces of the Ruh, or spirit; the Ruh which is said by some to be situated on the right hand side of the chest; and Sirr, or secret, between them both in the middle of the chest. In Taoism, the position of lalana chakra in the roof of the mouth corresponds with a point known as 'The Heavenly Pool'.